Drew Needham has been scuba diving on Chesapeake Bay oyster reefs since 2013, and it took him over a minute to list all the animals and plants he’s seen growing on them. He began with a market favorite. Onboard the Callinectes, the research vessel of the Paynter Lab at the University of Maryland, Needham continued by rattling off fish species including gobies, blennies and oyster toadfish. He added worms, soft corals, barnacles, mussels and clams. And he’s seen that submerged aquatic vegetation, which is experiencing a resurgence in the Chesapeake Bay, is able to get a hold on the harder substrate. 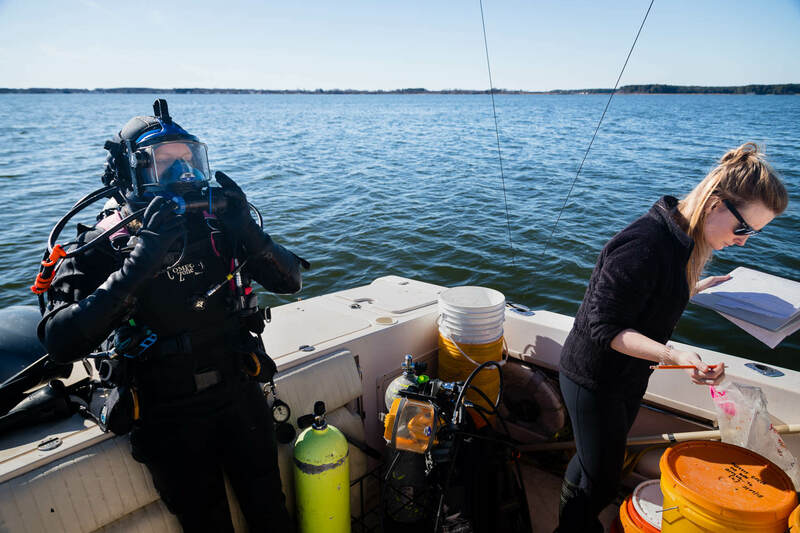 The signs of life are glimpses into the return of habitat functions that the Chesapeake Bay’s historic oyster reefs provided hundreds of years ago. Those large structures were akin to coral reefs, and so sizable that as late as the 1870s, the U.S. Coast Survey reported reefs breaking the surface of the water at low tide. 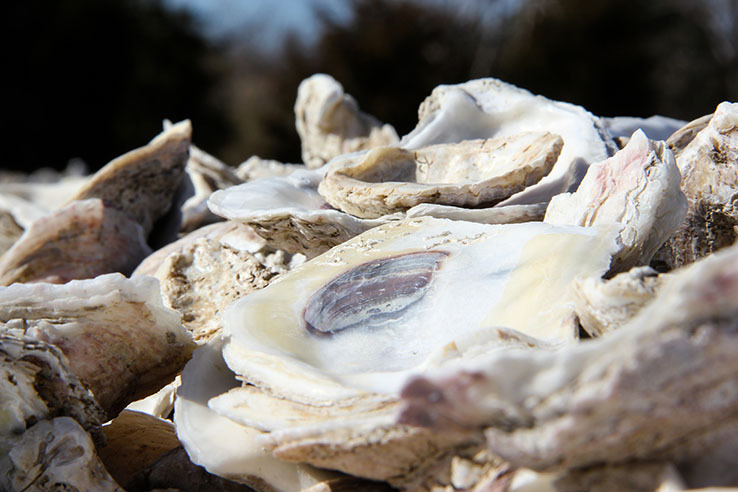 “They played this role of creating this large structure and having a very substantial biological effect on the water column and the inhabitants of the bottom community,” said Dr. Kennedy Paynter, whose lab has been monitoring oyster restoration in the Chesapeake Bay since the mid-1990s. Starting in the late 1800s, oyster harvesting gear destroyed the reef structures. Overharvesting and diseases reduced the oyster population to one percent of historical levels. Individual oysters can improve water quality by filtering up to 50 gallons a day, and before their numbers crashed, oysters could filter the volume of the Chesapeake Bay within a few days. But today it would take Chesapeake oysters over a year to filter the same amount. “The population was reduced from an ecologically significant one to one that was barely existent,” Paynter said. 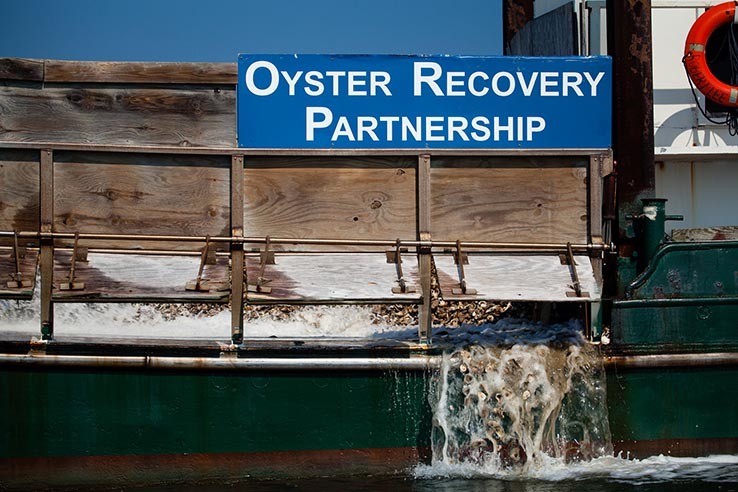 In 2010, Chesapeake Bay Program partners including the Army Corps of Engineers, National Oceanic and Atmospheric Administration (NOAA), Maryland Department of Natural Resources, and Oyster Recovery Partnership (ORP) began a large-scale, tributary-based restoration effort to build, seed and monitor oyster reefs. The 2014 Chesapeake Bay Watershed Agreement calls for oysters to be restored in ten tributaries—five in Maryland and five in Virginia—by 2025. ORP seeded Harris Creek from 2011 to 2015, mostly with spat from Horn Point Oyster Hatchery in Cambridge, Md., with additional spat from the Chesapeake Bay Foundation. A total of roughly 350 acres received two billion oysters, making Harris Creek one of the largest oyster restoration projects in the world. Before oyster reefs were constructed, a NOAA team used sonar to map historic reef sites that could be suitable for restoration. The Paynter Lab then conducted dives in spring to identify the portions of those acoustically identified sites that would be best for spat-on-shell—areas where baby oysters from a hatchery wouldn’t be smothered by sediment. Following plantings, the Paynter Lab conducted dives in the summer and fall. They sampled hatchery-deployed shells to count and measure surviving spat to determine short-term survival and size. “We not only offer advice upfront as to how to do oyster restoration best, based on what we’ve observed, but we also are continuing to measure what the outcomes are of the efforts that are ongoing, to continually improve them,” Paynter said. On an unseasonably warm day in February, the Callinectes passed through the Knapps Narrows Bridge on Tilghman Island and continued on to Harris Creek. The Paynter Lab would be surveying oyster restoration sites by conducting research dives to check-in three years after the reefs received spat. Needham and assistant lab manager Audrey McDowell were the divers that day, plunging in with a half-meter square made of PVC and a mesh sack. At randomly determined sites the divers drop the square, known as a quadrat, and collect all the oysters that fall within it. This allows the lab to collect data on things such as abundance and biomass while also recording information about the type of bottom on which the oysters are living. They also look for multiple generations, or year classes. of oysters growing together, a key sign of a self-sustaining reef. Oysters grow about an inch a year, so those year classes correspond to particular sizes. Oysters are considered “market” size when they reach 76 millimeters in length at about three years old. Small oysters (40–75 millimeters) are about one year old. And anything below 40 millimeters is considered spat. Because living oysters attach to each other, they form three-dimensional clumps that rise vertically above the sediment. These clumps not only avoid suffocation in the mud but also increase the surface area for additional oysters, as well as nooks and crannies that support other animals. The data collected by the Paynter Lab appears in NOAA’s annual Oyster Monitoring Report. The most recent report, from 2016, looked at 30 reefs totalling 90 acres that were planted in Harris Creek in 2013. It showed that 97 percent of those reefs met standards for biomass and oyster density—having at least 15 live oysters per square meter. The previous year showed that 100 percent of another 102 acres in Harris Creek met the same criteria. “We have live oysters creating habitat structure on the bottom and we see a lot of benthic communities recruiting into those areas and creating a rich benthic community which is exactly what we want to see happen,” Paynter said. The Harris Creek restoration plan allows for follow-up plantings of additional spat based on how well a reef looks during its three-year check-in. But most sites on Harris Creek have been able to skip this step. Harris Creek was the first Chesapeake tributary to be fully restored, and it is expected to be joined soon by Virginia’s Lafayette River. Maryland also recommended St. Mary’s River and Breton Bay for its final two sanctuaries to satisfy its oyster restoration commitment under the Watershed Agreement. Virginia committed to restore the Lafayette, Piankatank and Lynnhaven rivers in 2014, and more recently added the Great Wicomico and York Rivers. Next steps include six-year check-in surveys as well as additional monitoring to determine whether sanctuaries may be contributing to natural oyster recruitment in nearby areas open to harvest. 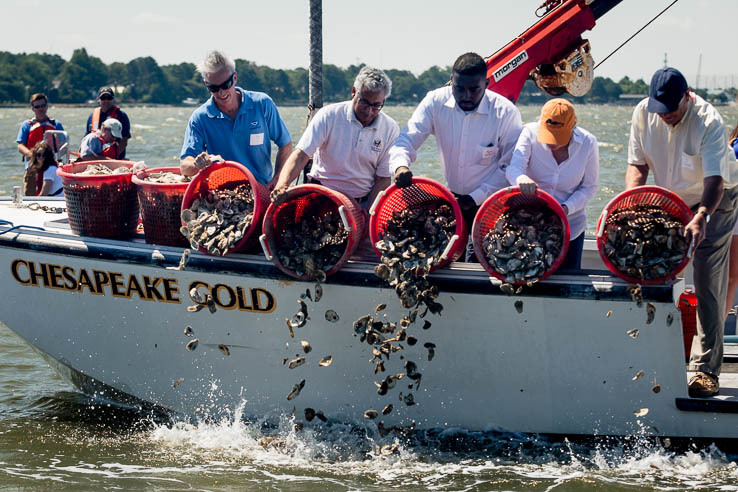 From the Field: Rebuilding oyster reefs in Harris Creek, Md.